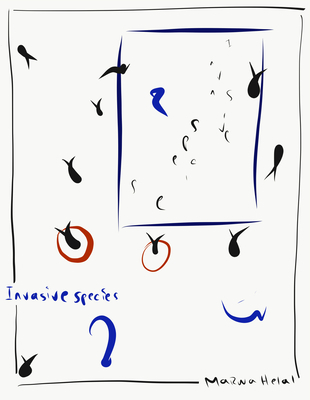 Join us at Book Culture on 112th on Wednesday, February 27th at 7pm for an evening of poetry reading with Marwa Helal and the new collection, Invasive species. Helal will be joined by Gala Mukomolova and Nkosi Nkululeko. Gala Mukomolova writes lyric astrology for NYLON. In 2016, Mukomolova won the 92nd Street Y Discovery/Boston Review Poetry Prize. Her first chapbook, One Above / One Below : Positions & Lamentations is available from Yes Yes Books. Her full-length collection, Without Protection, is forthcoming Spring 2019 from Coffee House Press. She was born in Moscow, the city that doesn't believe in tears. Nkosi Nkululeko, writer, chess player and musician, is a 2017 Poets House fellow. His poetry is currently published or forthcoming in Callaloo, The Collagist, Michigan Quarterly Review, Ploughshares, Third Coast, and more. He has been included in The Best American Poetry 2018 Anthology. Nkosi Nkululeko lives in Harlem, New York.